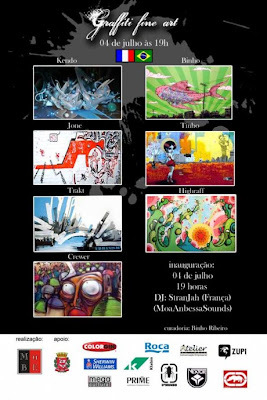 Amanha, sabado, no MuBE - Museu Brasileiro de Escultura, estarei inaugurando a exposicao 'Graffiti Fine Arts', que vai ate o dia 12 de julho e faz parte das comemoracoes do Ano da Franca no Brasil. Fazem parte da exposicao, os artistas franceses Kendo, Jone, Trakt e Crewer, e os artistas brasileiros Binho, Highraff e Tinho. Durante a abertura o DJ frances-brasileiro StranJah estara comandando as pick-ups. 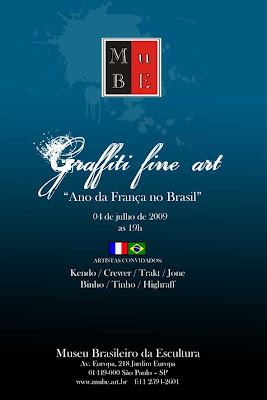 Tomorrow at the MuBE, we'll opening the show 'Graffiti Fine Arts' with the french artists Kendo, Jone, Trakt and Crewer and the brazilian artists Binho, Highraff and Tinho to celebrate the Year of France in Brazil. During the opening we have the french-brazilian DJ StranJah making the noise..